What a beautiful set in these amethyst purple Hazel Atlas Pressed glass footed goblets, only ever displayed and never used. 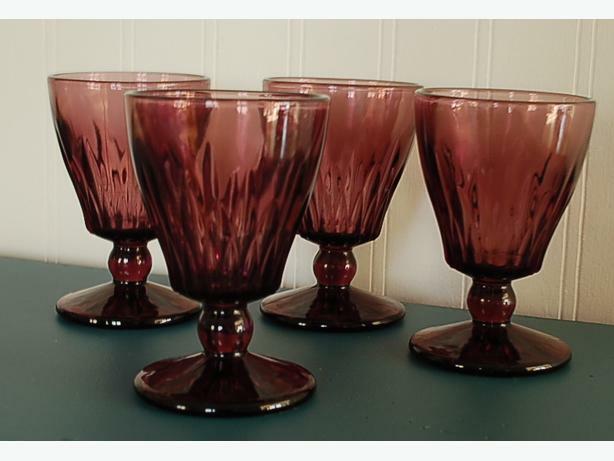 Produced between 1940 -1960, this delightful set of 4 goblets are gorgeous to serve to your company and are simply stunning in its purple hue and with its elegant etched vertical pattern crafted into the pressed glass and ornately styled base. Measures approximately 4 1/4" high and is great for serving cordial wine and sherry. All are in absolutely pristine and untouched condition!